From the “Revisiting the Early 70's” Series” by Paul J. Stankard. 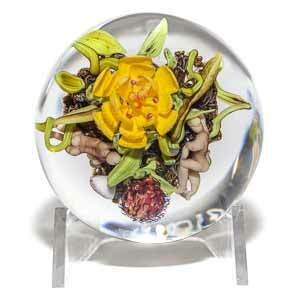 This miniature paperweight features 1 Large Yellow Daffodil-Like Flowers, 1 Fruit Pod, Green Leaves on a Clear Ground, 2018, 2.5″ d x 1.5″ H (approx.) Signature Cane. Paul Stankard is an internationally respected flamework artist. He creates natural environments in glass that challenge the viewer to move closer, rewarding them with unexpected delights. Stankard's respect for the natural world abounds, even in the simpler works from his early experimentation with botanicals. Paul has a long standing relationship with WheatonArts. One of the founders of the Creative Glass Center of America at WheatonArts, he has served on the Board for over 20 years. In September of 2007, Paul published his biography titled “No Green Berries or Leaves: The Creative Journey of an Artist in Glass”. Paul's latest book titled “Studio Craft as Career: A Guide to Achieving Excellence in Art-Making” features 49 distinguished artists creating innovative works.